Drawing on extensive archival research, including national and regional archives in Poland, it provides a detailed and nuanced understanding of the early years of communist rule in Poland. It shows how after the war the communist Polish Workers Party (PPR) was able to redirect widespread anger resulting from the actions of the NKVD, Soviet Army and the communists to more ‘realistic’ targets such as minority communities, and that this displacement of anger helped the party to connect with a broader constituency and present itself as the only party able to protect Polish interests. It considers the role played by the West, including the endorsement by the Grand Alliance of homogenising policies such as population transfer. It also explores the relationship between the communists and other powerful institutions in Polish society, such as the Catholic Church which was treated fairly liberally until late 1947 as it played an important function in identifying who was Polish. 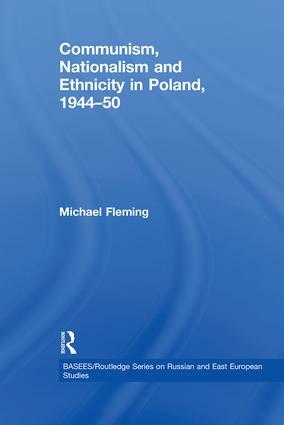 Finally, the book considers important episodes – hitherto neglected by scholars – that shed new light upon the emergence of the Cold War and the contours of Cold War geopolitics, such as the ‘Westphalian incident’ of 1947–48, and the arrival of Greek refugees in Poland in the period 1948–1950.